Are you one of the few wizards that has the ability to consistently win? Click here to play! Find out for yourself at this exciting slot and take home some incredible winnings today. 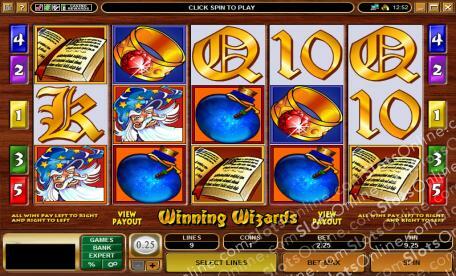 Winning Wizards is a thrilling 5-reel slot played across 5 pay lines, where the more lines opened allows for more combinations. In addition to the pay lines, there are five coins available to be played on each spin, with the more coins increasing your payouts on winning combos. There are no Wilds or Scatter symbols to distract you, so you can concentrate solely on winning. The Spell Books and Sceptres are lucrative indeed, but if you truly wish to experience the magic of the Winning Wizards Jackpot, then spin up 5 Wizards on an active pay line to receive 10,000 times your original wager. The Winning Wizards are waiting for their newest member. Will it be you?